Embsay & Bolton Abbey Steam Railway01756 710614work Steam RailwaySituated just outside Skipton in Yorkshire, the Embsay & Bolton Abbey Steam Railway runs 4 miles between the award winning station at Bolton Abbey and Embsay station built in 1888. Most trains are hauled by magnificently restored steam tank engines, the oldest one dating back to 1908. 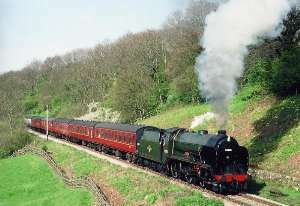 Steam trains run every Sunday throughout the year and up to 7 days a week in summer. Special events include Easter Egg Specials, Evening Eats on selected dates throughout the summer and Santa Specials on the run up to Christmas. There is a tea room at Bolton Abbey Station and picnic areas at both stations. There is ample free coach and car parking at both Bolton Abbey and Embsay stations. Groups are welcome with reserved seating and catering can be arranged to suit the organiser's requirements. The ruins of Bolton Abbey, a famous beauty spot, are a pleasant 1.5 mile walk away. Bolton Abbey Station is signposted on A59 Skipton to Harrogate road at Bolton Abbey. Disabled parking at both stations.